Teatro Della Concordia is know for a rather peculiar reason: it is known to be the world's smallest theater. It holds 99 seats, devided into box and orchestra. The audience is seated within overall 68sqm and the stage is 50sqm large. However due to its typical italien bell-shaped architecture it has the same acoustics as a bigger theater of that kind. You may visit the theater for free. 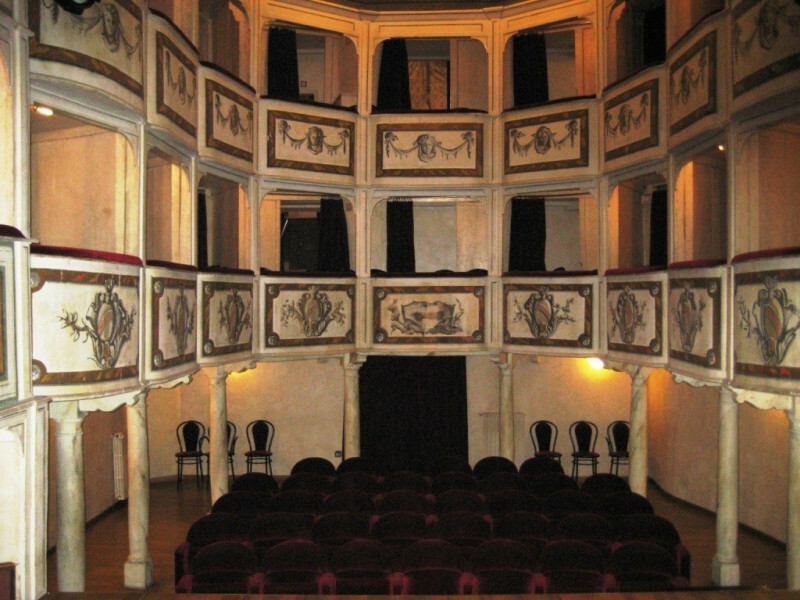 On a regular basis the theater shows italien plays and also hosts various events like exhibitions, readings and concerts. „unity“, was supposed to demonstrate the ideals of the French Revolution. In 1823 the Accademia dei soci del Teatro was founded to maintain the theater. In 1951 however the theater had to be closed due to its bad condition, was eventually restored in 1981 and reopended in 1993. Coming from Perugia take E45/SS3 and exit in Fratta Todina-Monte Castello V. Then continue for about 4km and turn left into Via Gente Vibia. Stay on that road until it merges into Via della B. J. Rovere and continue slightly to the right. Now turn right into Via Carosino afterwards left to stay on that road. Turning left again you drive into Via Roma, where you will find Piazza del Teatro on the left side. Coming from Terni take E45/SS3 and follow the signs once you are in Monte Castello die Vibio. Coming from Orvieto take SS71, continue on SS205 and afterwards on SS448, until you get on SS3. Continue like described above.